The first edition of ART, was organized in collaboration with the World Faiths Development Dialogue and Ahimsa Fund, in June, 2013. 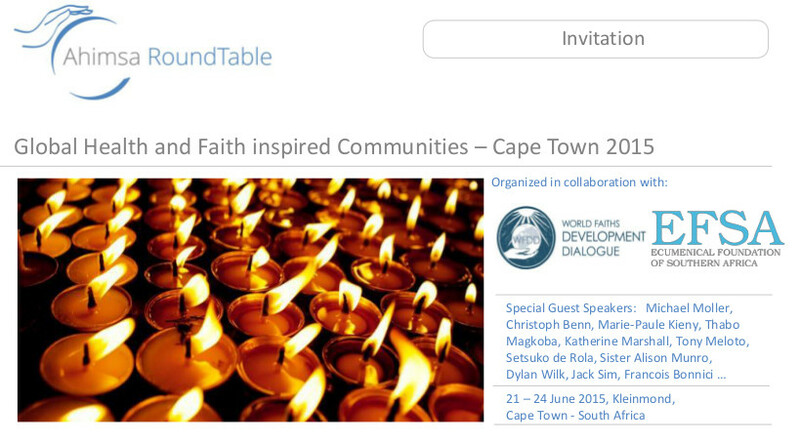 EFSA is the invitee for the next Forum, which will be held in Cape Town, from June 21 to 24, 2015. The central theme once again will be the work of faith inspired communities, and particularly their innovative aspects. The word “faith” in the conference title is used in the sense that the topic is not about religion or any denomination per se but is open to all, religious or non-religious, including indigenous communities. This second forum will thus bring together actors from different communities who can present and explore their experience, share its applications in different settings, and seek to reflect together on ways to develop and implement new and effective models for the most underprivileged in the world. Faith inspired communities carry out an extraordinary range of initiatives at community levels in many developing country settings, notably in the field of public health. Their work is often on the frontiers of innovation but, most important, often aims directly to reach the poorest and most excluded communities. Despite a remarkably diverse experience, the best and most promising initiatives are often little understood and appreciated by the global public health community. A central initial theme will be to explore the work of faith based communities and particularly its social entrepreneurship, service, and innovative dimensions. We aim to highlight successes and to explore how more active engagement with a variety of communities can help unite rather than divide societies. We are committed to holding a Forum that will propel and inspire change and lead to innovative new actions in the field of Global Health. The aim is to deliver concrete actions and recommendations, conveyed through a final report which will be completed no later than September 2015. The Forum will model probing dialogue and practical action around public health issues and thus help scale up successful initiatives in different world regions This in turn has significant potential to translate into tangible improvements for societies most in need, establish new networks for exchange, and identify shared experience and points of reference. Sharing experience, speaking about success stories, but also failures stories. Engaging the communities in working group in order to make clear and relevant proposals, discussing on new business models that will make the projects sustainable. Bridging cultures in order to find common values in the communities constituency, through very specific sessions, on Health, Ethics and Religion, on the post MDGs, on how culture react on specific issues (immunization), on the role that communities could play during epidemics. Once again we plan to engage a younger generation by including groups of students, from different countries, who will be full participants in the discussions. They are are key actors in today’s world. It is important to find and test ways in which they can participate in this type of engagement, which touches both on practice and ethics, on social and economic dimensions, and which calls for the heights of both technical and intellectual creativity. They will lead a specific session on how their generation can contribute to this huge faith inspired community partnership. Two central sessions will focus on Public Private Partnership, and the closing diner will feature several women and men who are indeed changing the world. The forum would thus have a deeper purpose and contribution: bringing different communities together, with the core purpose of allowing people to thrive with a clear sense of life’s purpose and possibility. It will conclude with clear recommendations that will give these ideas better visibility and lisibility in the Global Health landscape.